Hello everyone and welcome to my blog page. I started this page because I wanted to find others who also had a passion for reading and other awesomely nerdy things like I do. I love to read romance and YA/Teen books but I’m also equally happy reading anything from classics to humor to graphic novels and comics (I know, I’ve got a hell of a palette). I’m just as comfortable reading about Harry Potter (Expelliarmus!) and Lord of the Rings (no I don’t speak Elvish) to reading about Nikolai Andrushko (dreamy sigh) and Remington Tate (yummy). I’m just nerdy that way. My favorite types of books are paranormal and fantasy based but it’s really going to be on a day to day basis. I can get in to kicks where I just want to read dystopian, zombie driven books and then all of a sudden want to read something fun and romantic. It just depends on my mood. As I’m writing, I’ve got about three books I’m reading and all totally different from one another. I also prefer series rather than stand-alone books. I love seeing characters develop and their stories spin off to other great characters. My favorites so far are JD Robb’s In Death series and Darynda Jones Charley Davidson Series. 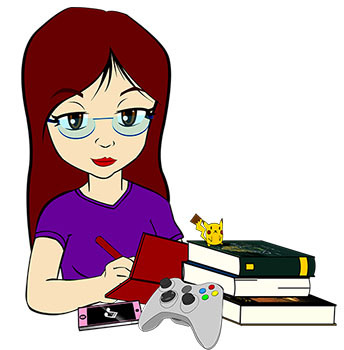 Besides my love of books, my other passion is gaming. I’m a huge fan of story driven games that really immerse you into a different world and make you feel like you’re not even playing a game. Assassin’s Creed, Fable and Skyrim make up most of my gaming favorites. These games have such great stories and plots, it’s like being inside a massive storybook where you can take on different roles and go in different directions. My goal for this blog is to recommend and review some great books, hopefully get people interested in other kinds of books outside their usual types and showcase my other loves. So welcome to NerdyChic.net everyone and I hope you enjoy the ride.